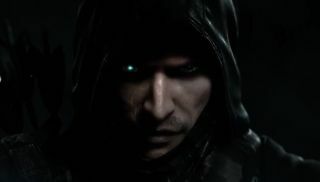 Like a stealth master, I've been lurking in the shadows of Tyler's Thief preview , after having pilfered Playstation Access' behind-the-scenes interviews with the team at Eidos Montreal. Admittedly, I've now made a rookie error by exposing myself to the digital light and shouting "Hey! Look at this!" Here, I'll leave the video with you for safekeeping while I attempt to rustle up some gas arrows and cover my clumsy escape. Try to ignore the fact that the video is called "Thief on PS4." Really what you're getting is a reassurance from the team about their commitment to preserving the spirit of the originals, and how they're testing out ways to keep fans happy while still offering options for Thief newcomers. There's even a bonus bit of Thief: The Dark Project footage, straight outta 1998. I now really want to play that again. Maybe I'll do so after I've slipped away from Playstation Access' dogged patrols. I think I hear something right now... Is that? It is... an Iron Beast! RUUUUUNNN!